We were in my old stomping grounds this past weekend: Florence, Italy, where I studied abroad my junior year through Gonzaga University. We also managed to hit 7 other cities/towns along the way: Prato, Monteriggioni, Siena, Pisa, Lucca, Collodi and Pistoia. 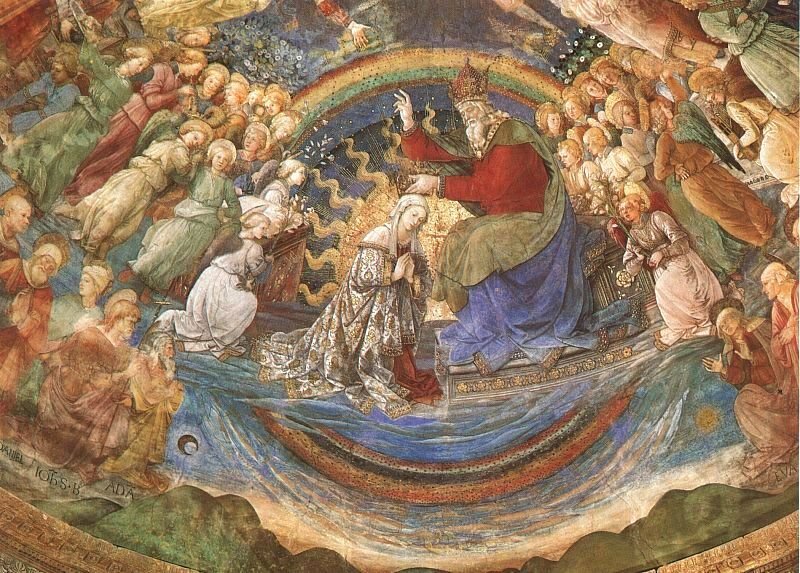 We took a pilgrimage to Prato first because I wanted to see some art by Fra’ Filippo Lippi, one of my favorite Renaissance painters. The Duomo in Prato houses some of his most beautiful fresco cycles, although my favorite is in Spoleto, which we saw last October (see photo below). Next, we went on to Florence. We packed in a lot in two days—we went to the Uffizi (my favorite art museum), San Lorenzo, Santa Maria Novella, Santa Croce, the Duomo, Piazza Signoria, Piazzale Michelangelo…and, we ate at La Spada, a rosticceria restaurant we used to frequent when I studied abroad. It was still delicious! The great thing about Florence (and Italy in general) is that you are able to soak in so much art in museums such as the Uffizi, but then you can step outside the museum walls and visit the churches for which these pieces were created. It provides an inimitable context for understanding not only why the artists painted what they did, but how and for what reason. On Saturday, we had lunch in the small hill town of Monteriggioni and then spent the afternoon in Siena. The Duomo of Siena is one of my favorite churches. It has spectacular inlaid marble floors and zebra-striped columns and a fabulous fresco-filled library, Biblioteca Piccolomoni. It’s well worth the entrance fee. We met up with a friend for drinks in Piazza del Campo and made sure to buy the famous Panforte and Panpepato cakes before we left. Sunday was a busy day, and it was by far the hottest day of the weekend. Poor little Alex was ready to melt, but he was a trooper throughout the trip! 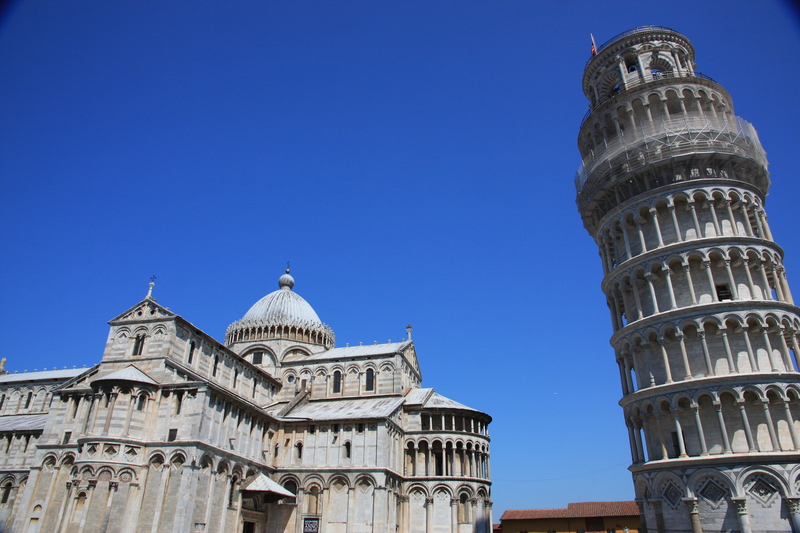 We drove to Pisa and spent a few hours in the Piazza dei Miracoli. The Leaning Tower, Duomo and Baptistry are all made of bright white marble so it was stunning against the immaculately kept green grass and the backdrop of the fierce blue sky. We then drove to Lucca and cooled off with some granitas in a piazza near the home of noted opera composer Giacomo Puccini. Maybe it was the heat, but I wasn’t that impressed with Lucca. Everyone talks about it as the ideal Tuscan town, and it’s a big stop for tourists, but I honestly didn’t see anything too special about it! We went to Pistoia later in the afternoon and I preferred it. Sitting for drinks with the Piazza del Duomo in the background…well, it’s something you can’t replicate in the U.S.
On the way to Pistoia, we made a brief stop in the town of Collodi and took pictures of the world’s tallest Pinocchio. 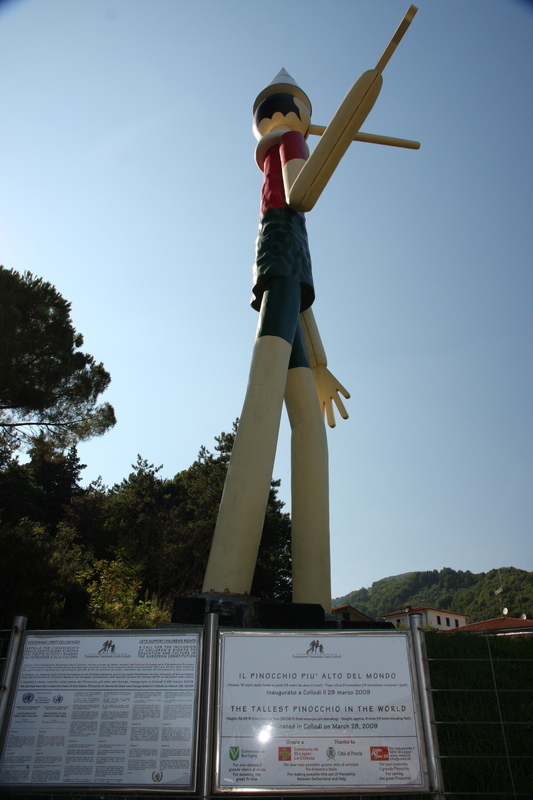 Collodi is the birthplace of Carlo Lorenzini (better known as Carlo Collodi), the author of The Adventures of Pinocchio. So, it was a whirlwind trip, but we had a great time. Take it from me—if you plan out your itinerary, you can definitely see Tuscany in 72 hours and not feel rushed. 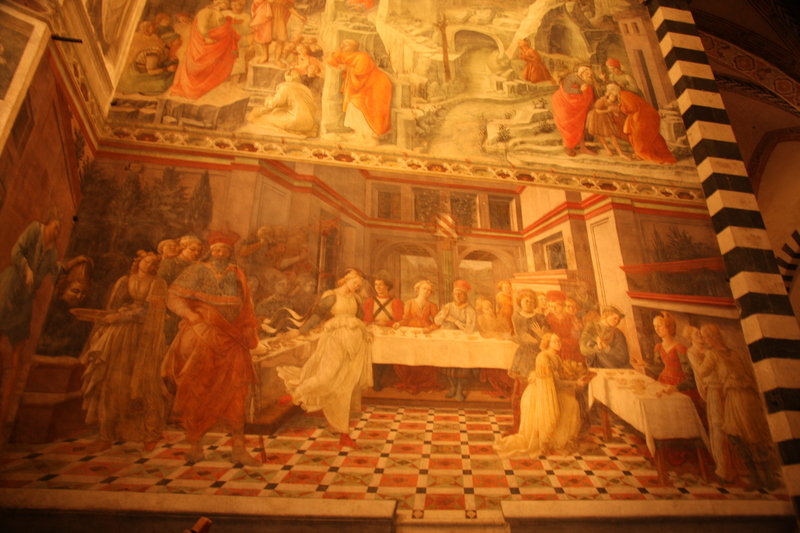 This entry was posted in Italy, pilgrimage, tourists, travel and tagged Collodi, Duomo, Florence, Fra Filippo Lippi, fresco, Gonzaga, Italy, La Spada, Lucca, panforte, Piazza dei Miracoli, Piazza del Campo, Pinocchio, Pisa, Pistoia, Prato, Puccini, Renaissance, San Lorenzo, Santa Croce, Santa Maria Novella, Siena, Tuscany, Uffizi. Bookmark the permalink.